VATICAN CITY – The Vatican’s special exhibit hall wasn’t big enough to honor the life and ministry of Pope John Paul II, so the exhibit begins in St. Peter’s Square, said Barbara Jatta, curator of what is described as Pope Benedict XVI’s special tribute to his predecessor. “The exhibit begins in the square, which for the first time ever for a beatification, is decorated with one large photograph of the pope with his pastoral staff as well as with photographs from each year of his pontificate,” Jatta told reporters April 28. 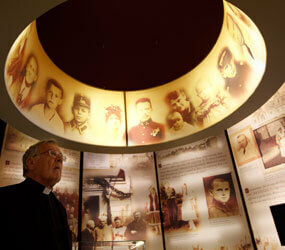 Visitors can enter the main exhibit, housed in the Carlo Magno Hall off of St. Peter’s Square, until July 24 for free. The exhibit is a collaborative effort of the Vatican governor’s office and the Polish Ministry of Culture and National Heritage. The entrance to the Carlo Magno Hall is under a super-sized replica of the Book of the Gospels; a hidden motor flips the pages, evoking a memory of how the wind turned the pages of the Gospel placed on Pope John Paul’s coffin during his funeral in 2005. The exhibit includes artifacts from the museum set up in his family home in Wadowice, Poland, like family photographs, a report card and the uniform he wore when he worked at the Solvay quarry and factory. Skis, boots and poles he used in the 1960s and a canoe from about the same time also are on display, along with prayer books and his black priest’s cassock. The exhibit contains a letter from Pope Pius XII naming him auxiliary bishop of Krakow in 1958 and one from Pope Paul VI naming him a cardinal in 1967. The section dealing with his 1978-2005 papacy includes the official medals from each year of his pontificate, a pair of his red shoes (which actually are more burgundy) and the mobile platform used to move him in processions after he could no longer walk. Opening the exhibit April 28, Cardinal Giovanni Lajolo, head of the Vatican governor’s office, said the exhibit could give people only a small idea of who Pope John Paul II was. “In particular, it isn’t possible to show the source from which he drew the strength and richness of his spirit,” although that was hinted at by the Book of the Gospels at the entrance and by the small replica of his private chapel at the other end of the Carlo Magno Hall, he said.